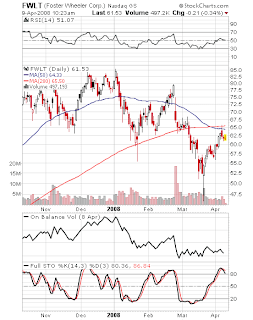 I am short 400 shares of FWLT at $62. The setup: Broken momentum stock rising up to and stalling at resistance in a loose bear flag. Poor OBV and volume pattern, with stochastics showing an overbought sell signal. I used a “sell short limit order” to place the trade. This type of order is great for part time traders who can’t watch the open. The stock closed yesterday at $61.74. I had decided I would enter on strength, so I placed the short limit order at $62. If I had not done so, I would have entered a little after 9 AM (central time) at $61.43. What’s your target for this one? or are you out already?